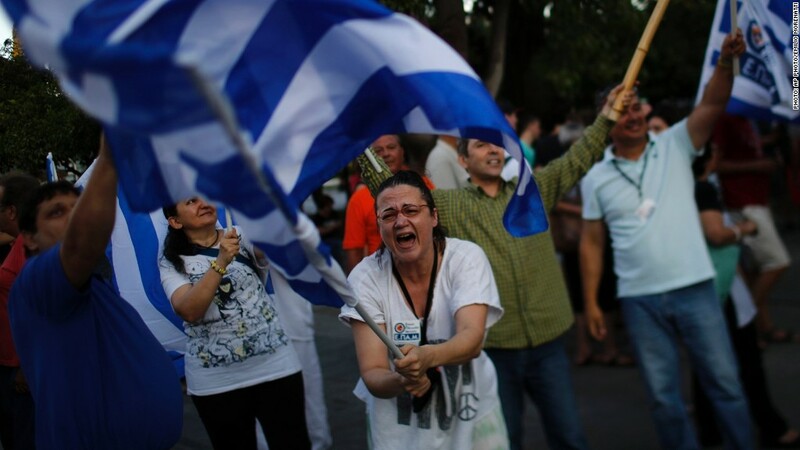 The Greek drama has spiraled out of control. The banks are closed and tens of thousands of people are protesting in the streets. But behind the headlines is a country in the middle of a deep recession -- and by many measures, it's a "depression." The country's GDP has shrunk by 25% in six years. Unemployment skyrocketed from 10% in 2010 to 25% in March. 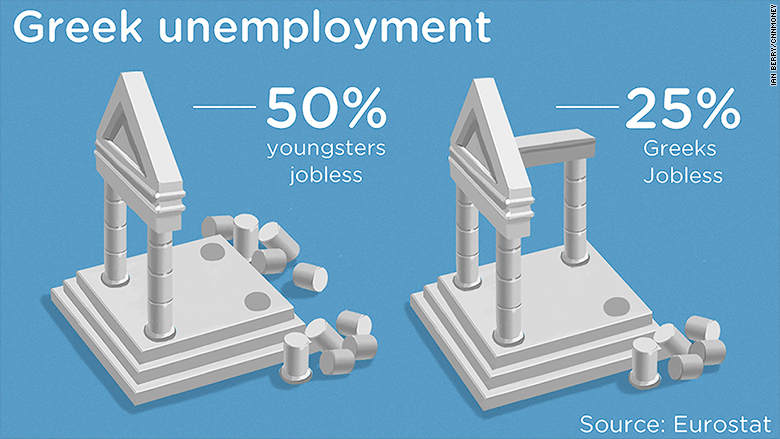 The young are hit the worst, with one in two under the age of 25 without a job. For many, leaving the country seems to be the only option -- 3% of the population has left since 2010. Those who are lucky enough to still have a job have seen their salaries slashed. Greece has experienced the largest fall in real wages across developed countries since 2008. These conditions have brought many businesses to their knees. Nearly 60 companies have closed each day this year. The historical center of Athens is now full of abandoned shops. Greece's generous pensions system was at the center of the bailout debate for years. The country spends more on pensions as a proportion of its economy than any country in the European Union -- more than double that of some, such as Slovakia, Estonia and Ireland. Pension payments have already been slashed by as much as 60% to average 830 euros a month ($930) in the past five years. EU data from last year show that 12% of Greek pensioners are at risk of poverty. That was still below the European average, and a lot less than in some other eurozone countries: 19% in Finland, and 16% in Austria are at risk of poverty. With high unemployment, pensions are the main source of income for many families. 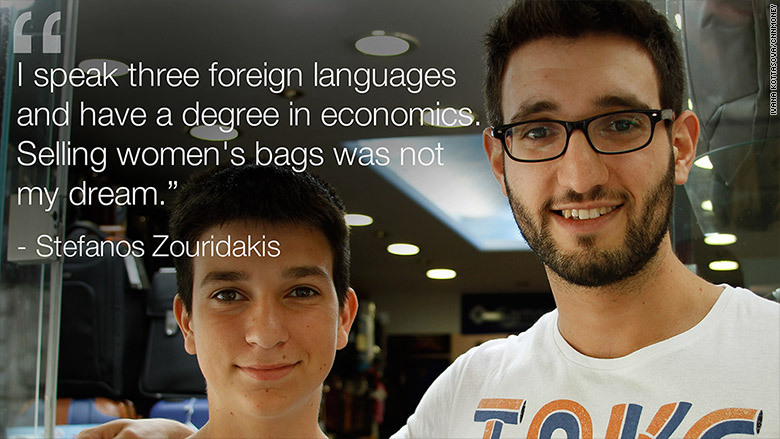 Konstantinos Papageorgiou's family is an example of this new reality. Apart from a few temporary jobs, he has been unemployed for two years since finishing university. He lives with his retired parents, who support him with their pensions. The Greek government always insisted it would prioritize pensions and public sector wages before IMF loan repayments if it started running out of money. But with the Greek banks shut, and capital controls imposed, many Greek pensioners without debit cards have been cut off from their funds this week. Some bank branches opened on Wednesday, the first time since last week, to allow crowds of pensioners to access their money. But even they were limited to taking just 120 euros out of their accounts. 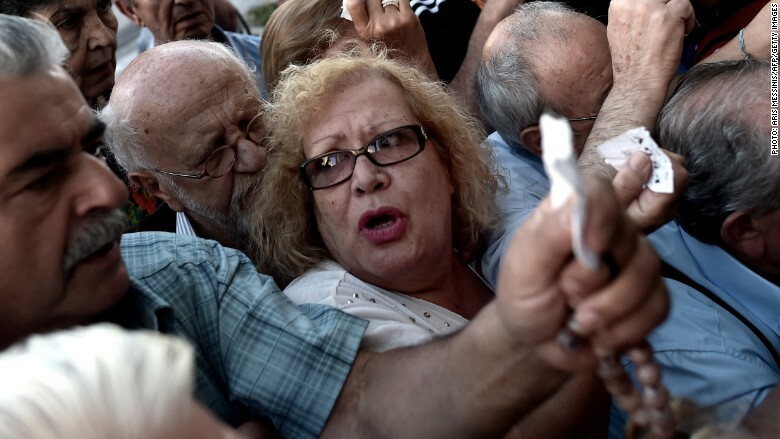 Pensioners queue outside a bank branch in Athens.